Phil Lord and Christopher Miller, the creative minds behind 'The Lego Movie' and '21 Jump Street', bring their unique talents to a fresh vision of a different Spider-Man Universe, with a groundbreaking visual style that’s the first of its kind. 'Spider-Man: Into the Spider-Verse' introduces Brooklyn teen Miles Morales, and the limitless possibilities of the Spider-Verse, where more than one can wear the mask. The 'Spider-man: Into the Spider-verse' competition has now closed. Winners will be announced shortly. Competition opens at 5pm AEDT on Sunday 24th March 2019 and closes at 11:59pm AEDT on Sunday 31st March 2019. Five winners will be chosen at random on Monday 1st April 2019. To successfully win, entrants must fulfil the above entry conditions before the time the competition closes. Current members/followers are eligible to enter the competition. Only one entry per person. Only one winner per household. To be a valid winner, the entrant must not have won a prize from SWITCH within the last 28 days. Each winner will receive one Blu-ray copy of 'Spider-man: Into the Spider-verse'. By entering, you agree to receive occasional emails from SWITCH in the future. If you decide to unsubscribe from these updates, any further entries will not be applicable. Only Australian residents are eligible to enter. 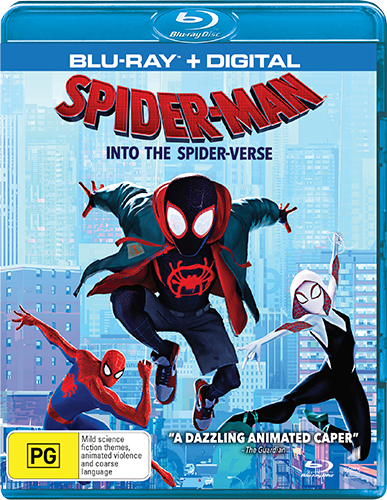 'Spider-man: Into the Spider-verse' is available on 3D Blu-ray, 4K Ultra HD, Blu-ray, Digital and DVD on Wednesday the 27th March 2019 from Universal Sony.